Sun Cellular is giving us more options to choose on their affordable Sun Trio Plan 350. Their latest addition of handsets are Cherry Mobile Flare, Samsung Galaxy Ch@t and Huawei Ascend Y210D, all device is powered by Android OS. With a monthly charge of P350 you can enjoy the Sun Trio 350 package, first is a free Android smartphone (choose on models mentioned above), second is enjoy unlimited Tri-net texts (Sun, Smart and Talk N Text), third and the last is the 24/7 Sun to Sun calls. On the handsets offered at Sun Trio Plan 350, we already posted the 3 new units added added on the list. First is Samsung Galaxy Chat which is also available free on Sun Plan 450 with free Samsung E2202 and Sun Group Plan 999 also come with free Samsung E2202. Galaxy Chat has a Blackberry like design with QWERTY keypad, Wi-Fi capable, 2MP camera and loaded with Android 4.0 OS. See - Sun Cellular Postpaid Samsung Galaxy Ch@t deals now Available Free at Sun Plan 350. Next is Cherry Mobile Flare, one of the most popular Android phone from Cherry Mobile that offers great specs and features. Flare is also available on Sun Trio Plan 350, on our post it comes on different profile that also offered in Trio Plan 350. Cherry Mobile Flare has 4 inch IPS screen, 1.2GHz processor, 5MP camera, 3G/WiFi capable and loaded with Android 4.0 ICS. For more specs of Flare see our post. See - Cherry Mobile Flare Android Smartphone offered Free on Sun Plan 350. Last and the latest handset we posted on Sun Plan 350 is the Huawei Ascend Y210D. The device is also available on Sun Trio Plan 350. See - Sun Cellular Postpaid Offers Huawei Ascend Y210D Free at Sun Plan 350. 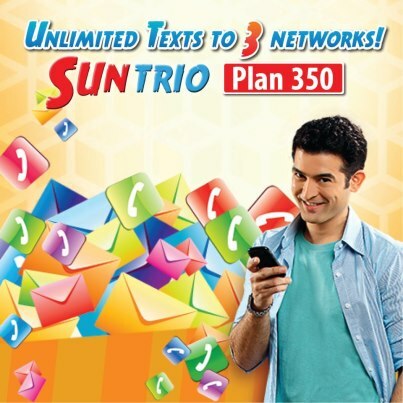 To apply Sun TRIO Plan 350, you can call 395-800 or visit your nearest Sun Shop to inquire before availing this postpaid plan. For list requirements on applying Sun Postpaid plan you may see here. Just comply to their terms and conditions and complete the applications requirements. pwede po ba sa prepaid sim yang trio unlimited? ?